MOFFETT FIELD, Calif. — NASA's prolific Kepler spacecraft could get a new mission that allows it to continue searching for alien planets, albeit in a modified fashion. Kepler team members are drawing up plans to repurpose the space telescope, whose original exoplanet hunt was derailed in May, when the second of its four orientation-maintaining reaction wheels failed. The potential "K2" mission would peer in the plane of Earth's orbit, hunting primarily for planets circling relatively small stars. "If we're looking at smaller stars at shorter [orbital] periods, we may find, in fact, many of those are also in the habitable zone," he added, referring to that just-right range of distances from a star where liquid water could potentially exist on a planet's surface. Kepler launched in March 2009 on a mission to determine how frequently Earth-like planets occur around the Milky Way galaxy. The spacecraft detects alien worlds by noting the brightness dips caused when planets transit, or pass in front of, their host stars from the instrument's perspective. This week, scientists are discussing the mission's latest alien planet discoveries at the Kepler Science Conference at NASA Research Park in Moffett Field, Calif. The $600 million Kepler mission has been incredibly successful, spotting more than 3,500 potential exoplanets so far. Just 167 of them have been confirmed by follow-up observations to date, but scientists expect that 90 percent or so will end up being the real deal. But Kepler is in a period of transition. The data-gathering portion of its primary mission ended in May when the second reaction wheel failed, robbing the spacecraft of its ultra-precise pointing ability. Engineers could not recover either wheel, and the mission team has thus been thinking hard about new ways to use Kepler, which is otherwise in good health. 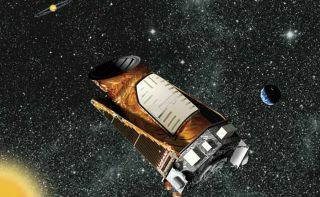 "The spacecraft's in great shape; the instrument's in great shape," Kepler project manager Charlie Sobeck, also of NASA's Ames Research Center, said during a presentation here Monday at the second Kepler Science Conference. Kepler has plenty of fuel left as well, he added. In August, NASA issued a call for new mission proposals, asking scientists around the world for ideas about the best ways to use a compromised Kepler. After reviewing these submissions, mission researchers have settled on K2, which they say should return valuable data in a variety of fields. During its original mission, Kepler stared continuously at more than 150,000 stars in a small patch of sky. But if K2 comes to pass, the instrument will take a broader view, covering five to 10 times more area. The K2 mission would have Kepler study four to six "fields" per year, observing each one for a minimum of 40 days but preferably for 70 to 80 days, Kepler project scientist Steve Howell, also of Ames, said here Monday during his talk at the conference. The spacecraft would study 10,000 to 20,000 targets within each field, he added. The K2 mission would likely turn up many small exoplanets around small stars, including some in the habitable zone, Howell said. It could also spot a number of alien worlds around bright stars, which would make good targets for follow-up observation by NASA's James Webb Space Telescope, an $8.8 billion instrument due to launch in 2018. K2 would be conducted at the same time that researchers are performing "close-out" work for the original Kepler mission, making sure they have squeezed all the important information out of the instrument's enormous data set. Both activities would likely be undertaken without a bump in Kepler's budget, which is currently about $18 million per year, Sobeck said. "Clearly, this is a challenge," he said. "It's not beyond the reach. I think it's something that we might be able to achieve." The Kepler team is currently working on the close-out plan for Kepler's original mission and the official proposal for K2, both of which are due to NASA headquarters by Nov. 20, Howell said. NASA officials will then decide by Dec. 6 if the K2 idea will progress to a vetting stage called "senior review," he added. But the ultimate call on K2, and Kepler's fate, likely won't come for a while. "We expect to hear that decision sometime toward the middle of next year," Borucki said.